Storyception Games are beginning their journey on a very ambitious project because Galactic Arena is intended to be the first in a series of five games from the Greek developers that explore the world of galactic conflict that is The Apocalypse Universe. 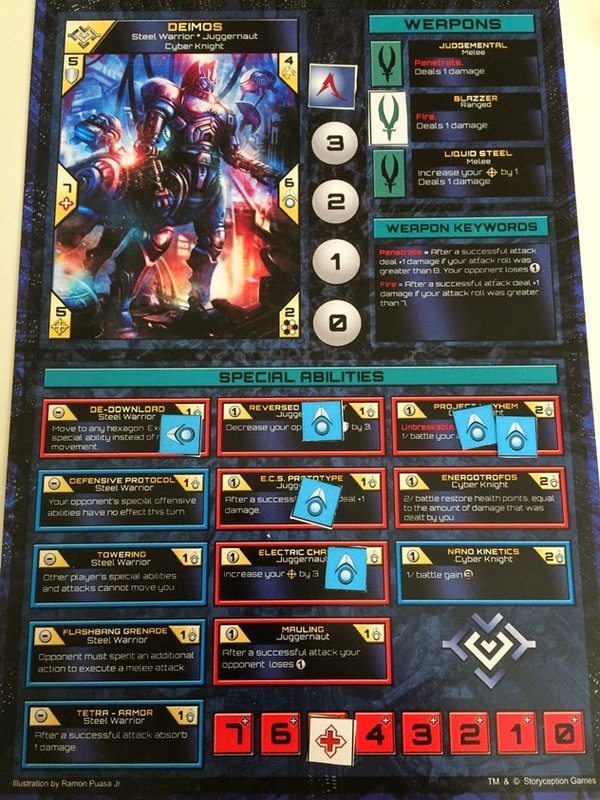 Characters will move between RPGs, tactical board games, dice games and card games. With such lofty goals it’s important that the first game in such a series hits the ground running and provides a compelling universe that players want to return to. Does Galactic Arena achieve this? The answer is; almost. Galactic Arena can be best explained as gladiators in space. A pair, or pair of teams, of bad asses from across the galaxy face off in an arena full of traps, barriers and loot crates. Imagine the gladiatorial section form Spartacus without all the bidding and backstabbing and made a lot more dynamic. A veritable rogue’s gallery of galactic gladiators has been assembled, each with unique statistics, weapons and special abilities. If the menagerie of muscle wasn’t enough, your character’s abilities are selected before each match up, meaning that every game can be different even when facing off against the same foes, giving the game plenty of variety. Combat in Galactic Arena is a relatively simple affair; merely a single dice off with bonus for a character’s attack and defence values. Where the subtlety derives is the use of special abilities, weapons and the application of action points. Every action, from moving to attacking, and even utilising special abilities, uses up action points. In addition, when defending an attack a player is forced to use an action point to defend. Run out of action points and you’re round is over leaving you defenceless and giving your opponent a distinct advantage. The exploitation of these action points is the real meat of the game and its most innovative mechanic. Conserving your action points for your better abilities and attacking your opponent just to force action point loss becomes the important tactical decisions in the game. 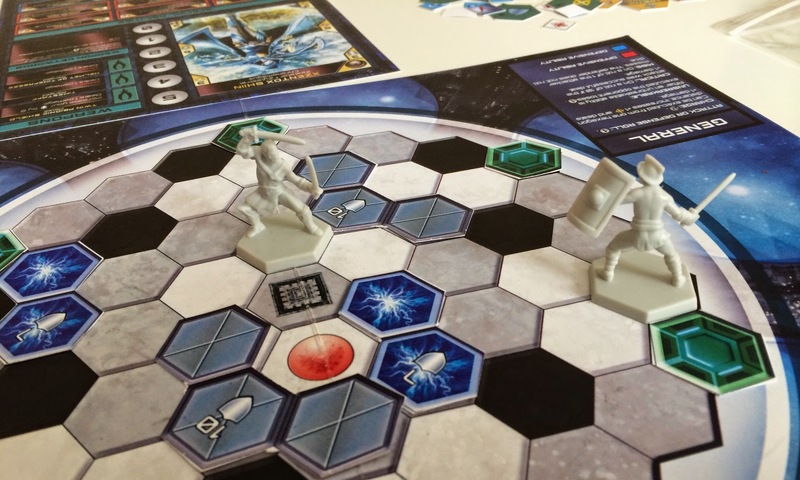 The result is a fast two player game that can be played in as little as 15 minutes. Overall it’s a fairly light affair and acts like a small slice of a miniature war-game. I mentioned above the similarities to the combat section of Spartacus, well Galactic Arena creates a deeper more dynamic combat, with more options and movement due to the trap laden arena and special abilities. 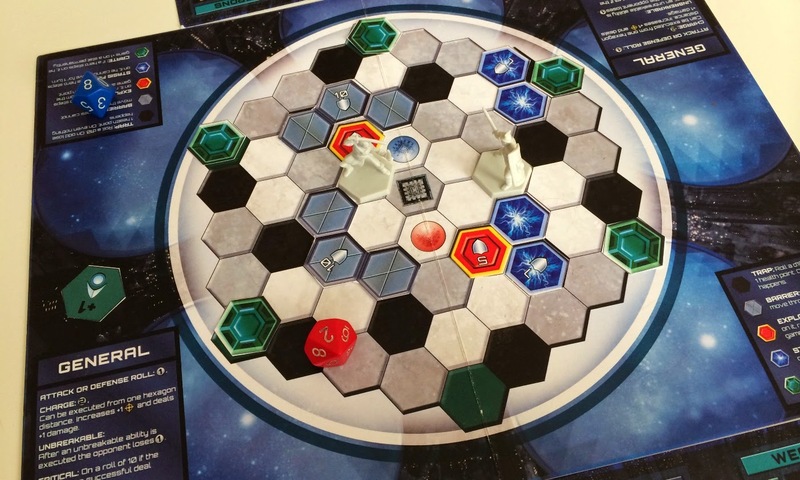 However, whereas in Spartacus the arena contributed to a larger game, in Galactic Arena this is the whole game and its currently missing some form of tournament or campaign that could help build the game into a more involving event. I’m going to have to be perfectly honest with you as I have struggled with Galactic Arena. The theme and artwork are very appealing and Storyception Games have obviously spent a lot of time and effort in developing the lore of the Apocalypse Universe. However, I struggled in comprehending the rules. Each time I’ve played I’ve either misinterpreted a rule or had the sinking sensation that I’ve missed an important concept. For such a simple game the written rules make things rather complicated. There’s also the issue with balance. There are 10 characters to choose from, which means there are 30 different weapons and 120 different special abilities potentially in play. Balancing this is going to be a complete nightmare and unfortunately it’s easy to select inappropriate abilities. It can make the game feel imbalanced but I’m sure with more experimenting with the different characters this feeling will go away. Now this is a Kickstarter prototype I have been playing and you can argue with being a beta release of the game there’s still plenty of time for the rule book to be tidied up and rules to be clarified. Galactic Arena also created an interesting phenomenon that I’ve not seen amongst my gaming group before. We played the game and discussed its merits and failings and immediately players started to think of ways to fix what they saw as short comings in the game’s design; change the abilities to a card based system, iconography on abilities to reference how it can be played, change the layout of the player cards so that the ability tokens don’t hide the ability text. To me this proves that the game has a big enough draw that my players want to play it and are keen to see the game work. Galactic Arena holds a lot of promise, drawing from a rich and detailed background setting it creates a tense and fast gladiatorial fighting game. The vast array of characters and special abilities means there’s plenty to customise from game to game and its quick pace and short play length means that the game never outstays its welcome. Unfortunately, the rules as currently written are a bit too loose and need tightening, especially where it come to the application of combat rounds and action point use. If these are done then I can see Galactic Arena being a game players want to come back to and I’m interested to see what the rest of the Apocalypse Universe has to offer.